The world is what we make of it. The power to change our world by seeing it differently is in all of us. Iqbal’s mission is to motivate people to take up photography as a form of creative expression. A breathtaking image is born out of the interplay of a range of elements. Much like the many experiences, influences, passions and dimensions that come together to make the man and photographer, Iqbal Mohamed. A man of few words, but myriad interests, Iqbal has never let rules or norms stifle his thoughts, freedom or expression. He stumbled upon photography as a young boy, and ever since, has felt an unparalleled sense of exhilaration whenever he is behind the lens. Iqbal discovered very early on, that photography is a bridge between what the eye sees and what the mind imagines. Iqbal Mohamed is one of India’s leading Professional Photographers. M.B.A, PSG College, Coimbatore & University of Madras, Chennai. Professional Photography, Brooks Institute of Photography, Santa Barbara, California, USA. Assisted some of the top Professional Photographers in Hollywood. Shot for NGOs such as Tamil Nadu AIDS control Society, CRY (Child Relief & You), Spastic Society of India, Health Department (of Tamil Nadu), etc. 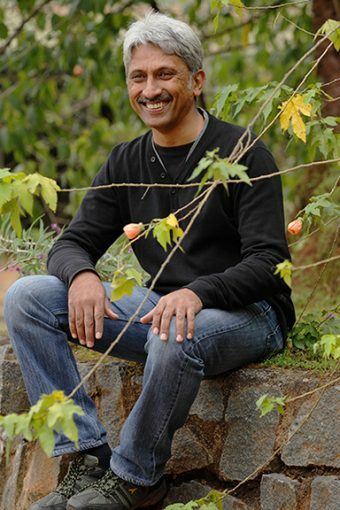 Founder of India’s first full-fledged Professional Photography Academy, “Light & Life Academy”, at Ooty, Tamil Nadu, in the year 2001. One of its kind, custom-built campus, with the support of Eastman Kodak (USA), Kodak India Limited, Calumet Photographic (USA), Gretag (Switzerland), Prolinchrom (India), Epson India, LMW & Zentask (India). Founder of India’s first online photography platform “LLA Online” present in 9 Indian Languages and English. Authored the first book of its kind: “Portrait & Function Photography”, in English and 8 Indian Languages. Photographed for the coffee-table book “Vibrant at 1000”, the thousand-year old Chola Temple, Tanjore, Tamil Nadu, India; UNESCO World Heritage. Nilgiri Mountain Railway and its steam engine, Tamil Nadu; UNESCO World Heritage. Mamallapuram monolithic temple structures, Tamil Nadu; UNESCO world heritage. Rameshwaram Temple, Tamil Nadu and its world’s longest pillared corridor; aerial photography of the Dhanushkodi and the islands around. Co-photographed for two coffee-table books “Karnataka” & “Bangalore”. Many different islands of the Andamans, including the Barren Island volcano. Landscapes in the Ladakh area of the Himalayas. Culture and life style in the Dal Lake area of Kashmir. Pushkar, world’s largest camel fair, in Rajasthan. Temples of Kancheepuram, Karaikudi & Sivagangai, Tamil Nadu. Chirapunji & the mountainscapes around, state of Meghalaya, wettest place in the world. Buddhist Monasteries, in the Himalayan Kingdom of Bhutan. Churches of Cologne, Germany and Salzburg, Austria. Architecture of Amsterdam (Holland), Brussels (Belgium) and Paris (France). Ankorwat Temples, Cambodia, world’s largest temple complex. Landscapes, off the Great Ocean Road, Australia. Yosemite Valley, California, USA, world’s highest concentration of tall waterfalls. Landscapes of the Grand Canyon, Arizona, USA, world’s largest canyon. Landscapes in Death Valley, California, hottest desert and lowest land below sea level, in the world. Travelling, Trekking, Cycling, Martial Arts, Reading. Listening to Music, watching Sports, watching Movies, etc.